Something I’ve been trying to do for Alluvial’s “Global Quality and Income” strategy is to build in a little additional inflation protection. Equities offer a decent inflation hedge in and of themselves, but I believe certain industries offer especially good protection, typically industries that own hard assets. One specific industry with attractive inflation hedging qualities is timber. In the course of seeking out a suitable investment candidate, I’ve come across what I believe to be an extremely well-managed but over-looked timber company: Pope Resources, LP. Pope Resources boasts a long history of success, an astute management team and a strong collection of forestry and development assets. There’s something delightfully simple about the timber industry. Plant a forest. Tend to it as it grows. At the proper time, harvest the timber and re-start the process. I don’t mean to imply that forestry is easy or doesn’t require a lot of skill. On the contrary, I’ve seen what goes into a well-managed forestry practice, and it requires an incredible level of scientific and market knowledge. And the labor involved at the ground level can be backbreaking and dangerous. But compared to the complicated financial engineering, frantic advertising and ruthlessly short product lifecycles that characterize many industries and companies, forestry seems a calm, timeless enterprise that has occupied mankind for thousands of years and will continue to do so. Pope Resources was spun out as an MLP from Pope & Talbot in 1985. Over the years, the company has stewarded its forests, harvesting according to market conditions and also selling off various parcels to real estate developers. Today, Pope Resources owns 110,000 acres of timberland in Washington and Oregon, plus another 2,900 acres of property held for development in Washington. Additionally, Pope Resources has a private equity business that manages timberland funds holding 91,000 acres. Pope’s own interest in these funds is approximately 15%. I’m no timber expert. I did grow up in a timber-producing region and spent a miserable summer toiling in a sawmill, but my knowledge of the financial and investment aspects of the industry come solely through my readings on the subject. I don’t know if the acreage held by Pope Resources is more or less productive than other parcels in the Pacific Northwest, nor if the company’s specific species mix and tree age profile will result in higher or lower yields in coming years. However, I believe I can trust management to get the most from its assets. I may not be a timber expert, but I believe I can recognize a well-managed company when I see one. Short-term stock returns are driven by all sorts of factors, some within management’s control and others, not. But long-term returns to shareholders are strongly influenced by the quality and composition of a company’s assets, and the competency with which those assets are managed. A look at Pope Resources’ historical returns to unitholders indicates just how potent the combination of good assets and good management has been. 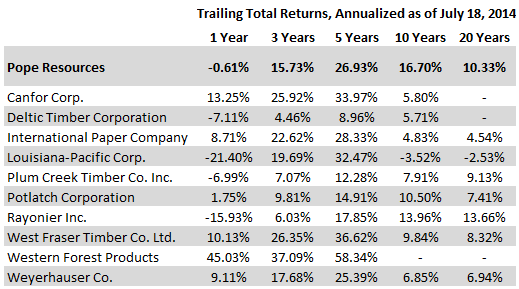 Short-term performance has been competitive, while long-term performance has been superior. I did my best to construct a set of comparable companies, against which to compare Pope Resources. Some of these companies also have operations in pulp, newsprint and other timber-adjacent businesses, but for the most part they make their money the same way as Pope Resources. Besides Rayonier, which benefited from its performance fibers business for most of the time periods in question, Pope Resources is the clear champion, multiplying unitholder wealth more than sevenfold over the past two decades. Of course, past success is no guarantee of future excess returns. But I have found that competent management teams typically continue to behave competently, while inept management teams usually continue to…..well, just take a look at Louisiana-Pacific. I trust Pope Resources’ leaders to continue to steward the company well. Management’s own holdings in the company are currently worth nearly $40 million, easily enough to incentivize them to continue to growth the company’s worth. It’s not just me who thinks highly of Pope’s management. Rayonier recently split into two companies, with the CEO headed to the spin-off fibers company. Who did Rayonier tap to take over leadership at the legacy company? None other than the CEO of Pope Resources, David L. Nunes. Pope has since replaced Mr. Nunes with Mr. Thomas M. Ringo, previously the CFO. With 25 years at Pope, Mr. Ringo is a fine choice to take the reins. 1. An attractive asset mix – Pope’s standing timber has a high concentration of Douglas Fir, which commands a pricing premium. 2. Strong export capabilities – Pope’s location allows it to meet surging demand from Asia for premium wood products. The export market accounted for 40% of revenues in 2013. 3. Excellent development opportunities – Pope’s development properties are situated just outside the Seattle. The Seattle metro is one of the best-performing markets in terms of job creation and unemployment in the US, a fact that should help Pope profit on sales of land to developers. Thus far in 2014, Pope has reaped $15 million from land sales, more than twice the book value of the land sold, and expects to “harvest” large rewards from land sales in the Seattle area from the present through 2015. At quarter’s end, Pope’s land held for development had a book value of $27.6 million. Pope Resources may possess a strong mix of assets and a savvy and an incentivized management team, but I still wouldn’t be so interested if the company’s trading price exceeded the value of its assets. Fortunately, that’s not the case. On a per-acre basis, the market values Pope at a discount to comparable timber properties in the Pacific Northwest. Because GAAP rules force the company to consolidate its managed funds, Pope’s GAAP balance sheet is a little misleading. Fortunately, since the company provides detailed information on the timber acreage and associated debt of each fund, it is possible to determine the company’s proportional acreage and to compare this against adjusted enterprise value. First, the acreage. Pope’s net acreage of 123,650 excludes the 2,900 in development land, but I’ll account for the that in the enterprise value. Net comes the task of calculating enterprise value. The final step in calculating Pope’s value per acre of timber is to adjust enterprise value for the company’s development land. This is more of an art than a science, since the selling price of the Washington land can’t be predicted with any degree of accuracy. Recent land sales have occurred at more than twice book value, so I’ll consider three scenarios: one where the land is worth book value, one where it’s worth 1.5x book value and one where it’s worth 2x book value. Book value multiples of 1.0-2.0 imply per acre valuations of $2,112 to $2,335. Either end of this range is below the average valuation of comparable properties in Pope’s location and market segment. The most recent data from NCREIF pegs valuations for Northwestern US timberlands at right around $2,400 per acre. Pope’s strong asset profile likely justifies an above-average valuation, but I’m fine using NCREIF’s estimate as a measuring stick. NCREIF notes that timber valuations are experiencing support from Asian demand, but housing starts in the US remain well below their pre-crisis levels, tempering prices. Should housing starts pick up steam, timber prices may rise. Or, they may fall. I don’t waste my time trying to predict moves in commodities prices. As uncertain as the market can be in the short run, I am confident of one thing: Pope Resources will continue to reward unitholders for many years to come. Pope Resources, LP is a master limited partnership. MLPs carry unique tax considerations, especially for tax-deferred accounts. Investors should carefully examine these tax effects before investing in MLPs. Alluvial Capital Managment, LLC holds shares of Pope Resources, LP for client accounts. I just quickly glanced at the company and I noticed for the last 10yrs revenue growth has been 5.95% annualized whereas cost of goods sold has increased by 10.07% annualized. This leads me to believe the company doesn’t have pricing power or operating leverage. I don’t think this company will fare well in an inflationary environment. Return on Capital from the last ten years has averaged ~7%. Capital requirements look high as well, the last thing you want is replacing a ton of equipment as raw material prices increases. Most equities do terrible in an inflation environment, take a look at the 70s… investors lost a significant portion of their buying power by being invested in equities. Buying companies with pricing power and low capex needs relative to FCF is your only protection. I appreciate your comments, but I have to disagree with you on a few points. First, the 70s represent only a short period in the history of the stock market, and were affected by many other factors including high unemployment, slow growth, high interest rates, war and energy uncertainty. I think it’s a stretch to assign blame for the decade’s poor returns to high inflation alone. True, the long-term effectiveness of equities as a hedge against inflation is an area of dispute, but multiple recent papers have suggested that real equity returns are consistent through periods of both low and high inflation. I recognize the issue is far from settled, but I think we can agree that equities at least represent a better investment alternative in times of inflation than cash or fixed income instruments. To your second point, I don’t think that examining the evolution of gross margins over time very informative in evaluating Pope. For one, Pope has substantial discretion in which assets it chooses to sell in any particular year, which results in high margin volatility over time. Unlike a typical manufacturer, which builds and sells as much product as it profitably can year in, year out, Pope is able to leave its “inventory” in the field in hopes of fetching a better future price. For example, Pope cut its timber sales dramatically from 2007 to 2009, choosing to reduce its harvest while timber sales were low. In the trailing decade, Pope’s gross margin varied from 43% to 62% and currently sits at the bottom of that range. I don’t think its fair to look at Pope’s recent depressed results and conclude things will be that way forever. As for return on capital, those figures are distorted by the managed funds consolidated on Pope’s balance sheet. Over the last ten years, return on partners’ capital averaged a respectable 11.6%. Keep in mind this period included one of the worst housing busts in US history, and Pope earned practically nothing from 2008 to 2010. Excluding those years, return on partners’ capital averaged 15.5%. If the price of timber rises, due to inflation or anything else, Pope will benefit. That’s the nature of commodities producers. When price levels rise, so does the value of their reserves. Timber is even better, because it naturally creates more of itself, compared to silver or iron ore which lay inert underground. Not sure if we can agree that cash is worse than equities in times of inflation. The research that I have seen suggests the opposite, and I also think this makes sense: short-term rates are expected to adjust quickly when inflation skyrockets so you will do fine if you own cash. That’s a reasonable point. There’s no guarantee that short-term rates will exceed inflation (see: the present), but interest rates certainly would adjust to a sustained inflationary period. I think we also must distinguish between periods of moderately elevated inflation, say 3-5%, versus a true inflationary shock or spiral. I doubt equities would be very much affected by the first scenario, but could experience some short-term stress in the short run in the second scenario. FYI, your blog is one of my favorites. There are two types of businesses: price competitive and pricing power. A price competitive business that’s spending a large % of their operating cash flow on capex just to maintain the status quo is going to get killed by inflation if they cannot offset the cost increases. A business with pricing power that spends very little of their operating cash flow on capex/investments is going to fare much better when wages, raw goods, etc all increases in cost. A commodity business might have their good share of fortune by being in the right business (ie oil companies from 2000 – 2007), or being in the wrong business (coal companies 2007-2014). I have no opinion on the timber business. Measuring the % growth in revenue vs COGS & SG&A over a long period of time is good insight into the economic trait of the business. Revenue increasing faster than COGS will create an exponential effect on operating income. If there are economies of scale then you witness another compounding effect on the bottom line. For example 6% revenue growth and only 1.7% growth in COGS will result in FCF growth of 16%/yr. Check out the 10yr financials on Union Pacific. Amazing what pricing power & economies of scale for a boring commodity like business can achieve. I totally agree that for normal companies, positive operating leverage is a huge contributor to long-term returns. But, things are a little different with timber companies. Pope could refrain from selling a single tree in the next ten years, and the company would still be worth more in ten years than it is now because the amount of harvestable timber would increase. Any increase in timber prices over the same time period, due to inflation or market forces, would further increase the rate of return. For example, let’s say the amount of harvestable timber on Pope’s lands increases by 5% annually through natural growth, and inflation runs at 3% annually for the next ten years. Pope’s value would appreciate at roughly 8% per year over the time period, less an allowance for corporate costs. If inflation ran higher, the company’s value would appreciate at a higher rate. There’s the built-in inflation protection. Of course, Pope converts some of the increase in harvestable timber into current profit and yield by conducting yearly harvesting. Holding inventory and selling when the market prices firms up sounds interesting. It seems like Pope is a play on real interest rates with a free call option on a recovery in the housing market. That’s what I’d call it. Also makes sense to think of the company as owning a call option on unexpected inflation. At current prices, I believe that option is free. I’ve been thinking about your reasoning on increasing value of the timber as they wait and for higher prices. In the short/medium term that means they make on average more money, but what about the long term? The fully grown trees aren’t cut and the area isnt replanted, doesnt the lost ‘growth-time’ costs inventory/money as well? Unless you have more timber than the market needs at all time, you seem to lose out later on (how much is unclear). For a ‘buy-and-hold’ investor it seems like things average out and this discussion is pointless. Then again, for a buy-and-hold investor this kind of company might not be too interesting to invest in. So i wonder, is this the kind of company that you ride and sell when the cycle works in your favour? ps. I’m new at investing and i have no clue how companies like Pope function. Thanks, I do check into LAACZ from time to time. Mind giving me a quick summary of why you think the NAV is so much higher?